4 February 2019 – On 1 February, the international animal welfare organisation FOUR PAWS successfully transferred two of the last restaurant bears from Albania to Arosa Bear Sanctuary in Switzerland. The two 13-year-old bears spent their lives in a private mini zoo near a restaurant in Albania. After four days and 2,436 kilometres through five countries, the two bears arrived safely in Arosa Bear Sanctuary. The bears were given their names when they arrived: known now as Meimo and Amelia, the bears join fellow resident Napa in the snow-clad Swiss Alps. The transfer to Arosa had to be planned and executed at very short notice as the mini zoo where the bears lived was to be closed and demolished at the end of January. The winter conditions in snow-covered Arosa presented the team with a number of logistical hurdles. “One of the biggest challenges was to get the bears safely to the sanctuary within all the snow. Like Napa before, we took the bears up to the middle station by gondola. For the last few metres to the sanctuary, a snow groomer was used that was specially rebuilt to transport the bears. We are proud that everything went smoothly and that we were able to overcome all challenges successfully,” says Carsten Hertwig, bear expert at FOUR PAWS. The transfer went without any delays or surprises and Amelia and Meimo seemed to like their new home immediately. They are interested in exploring the surroundings and have already made themselves comfortable after their adventurous journey. 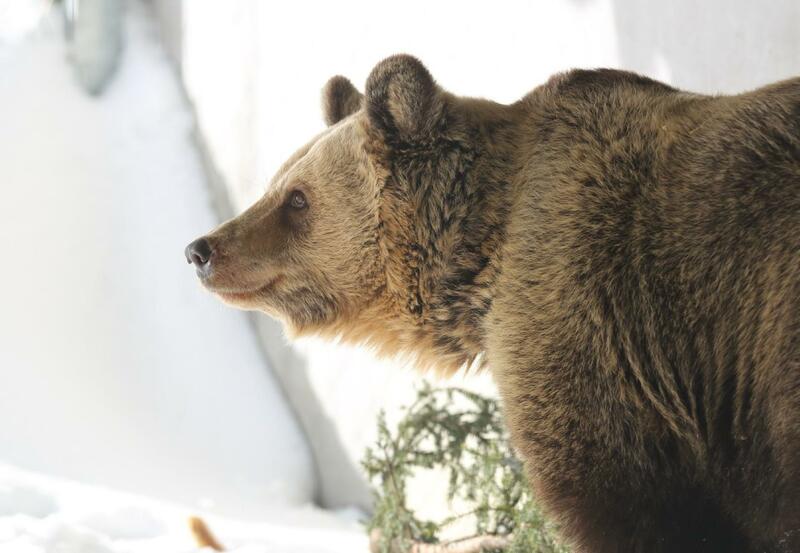 Former Serbian circus bear Napa has been living at Arosa Bear Sanctuary since July 2018 and was the first inhabitant. He was puzzled when suddenly two new neighbours stood at his door. Curiously, he watched the arrival from his separated area of the enclosure and never let his fellow bears out of his sight for a second. Napa and the two newcomers will now have the opportunity to sniff each other through the fence. Meimo and Amelia will have their settling in phase in the inside enclosure since, due to the current snow height, the outside enclosure is closed until further notice. The team at Arosa Bear Sanctuary is optimistic that the two healthy and well-fed newcomers will also be hibernating in a few days’ time. The scientific director Hans Schmid bases this hope on the planned feeding concept: “We will reduce the amount of food in the first few days and expect the bears to go into hibernation quite naturally”. In the spring, the aim is to socialise the bears in the outdoor enclosure. With a size of three hectares, the sanctuary offers many opportunities for each individual bear to retreat at any time.